Some days are better, some days are not. Today was not. And still, regardless of how I feel, there are always images that sneak to my attention. Or the Image of the Day. In reality the first thing that caught my attention was the tree in the background with its beautiful leaves, in shape as well as in color. And then I saw the rose. The Song of the Day is “La Vie En Rose” from Cyndi Lauper’s 2003 album “At Last”. Hear it on YouTube. A wonderful example of how to break the rule of thirds. Nicely done. However the second photo is the one that has my attention. There is an element of abstraction that's been achieved without taking anything away (the usual technique of creating an abstract) but rather by adding the element of water drops. I wonder what it says about me that as much as I like your image of the rose (and not only for the broken rule) I would be more likely to place your second image on a wall than the first. BTW, La Vie En Rose is one of my favourite songs and Lauper is a great singer but I never liked her rendition of this song. I always find myself returning to Piaf or Armstrong whenever I want to listen to it. 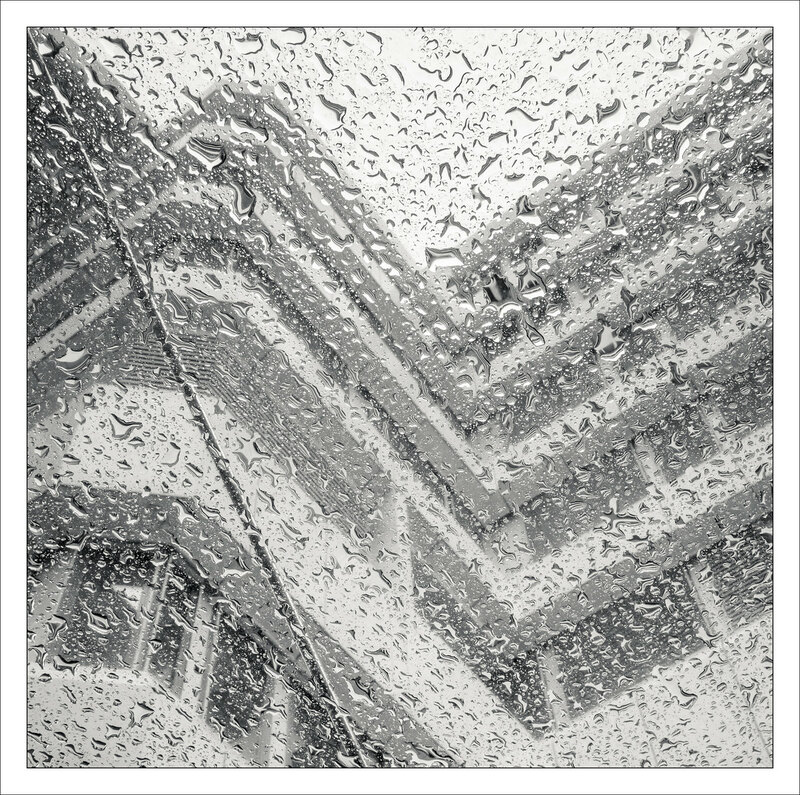 “It rained, I stood under a glass roof and looked up at some modern architecture. It took me some experimenting in Lightroom to find a tonal balance that would emphasize mainly the water drops. I think I found it 😄” Yes I think you did. I really like the tonal values of this image. I'm no fan of so called modern architecture believing that Friedensreich Hundertwasser was right in his saying that the straight line is godless, but this picture has feeling. It's interesting how far Adobe have come with their process. Images have become so pliable in the RAW converter, I often think I can do things in Lightroom that I couldn't easily do in Photoshop CS3. And it's not that sooo much time has passed. Yes, I am really pleased with how the drops came out. 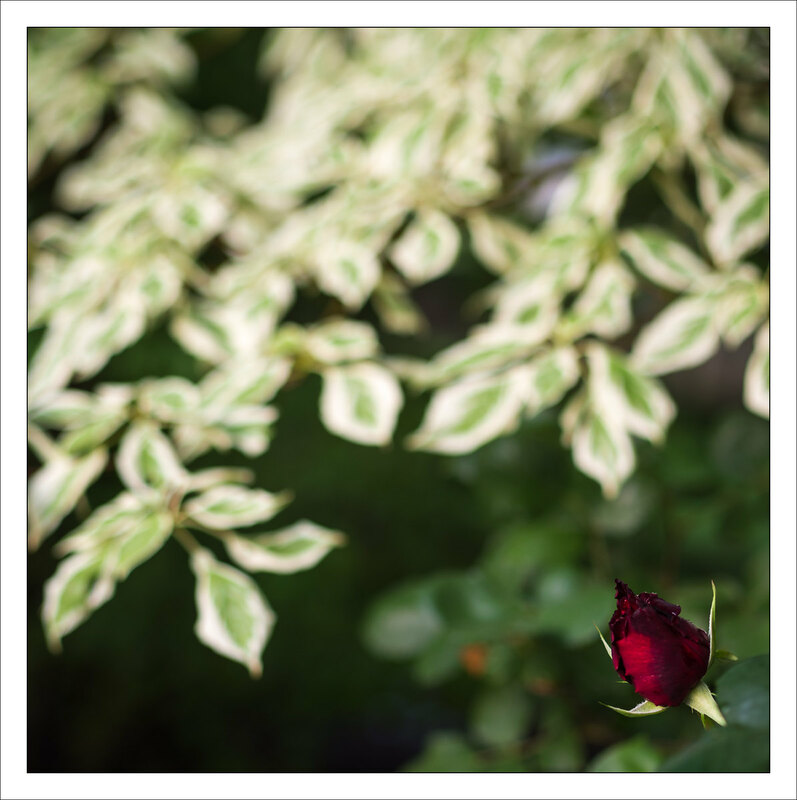 I like the rose, because you broke the so-called "rule of thirds." But I too like the image of the building seen through water drops better. Unusual treatment of the subject matter. I too prefer Piaf's or Armstrong's renditions, lol. I'll bet if we'd been able to hear Piaf in person, we would have had chills.